The EJE 120 walkie pallet truck is designed for loading and unloading trailers and transporting loads over short distances. With a variety of different battery compartments available the ability to customize for your warehouse application is done with ease. With its compact design the EJE 120 can maneuver in confined spaces for added productivity. Jungheinrich's exclusive 3-phase AC motor provides outstanding efficiency due to excellent energy control. 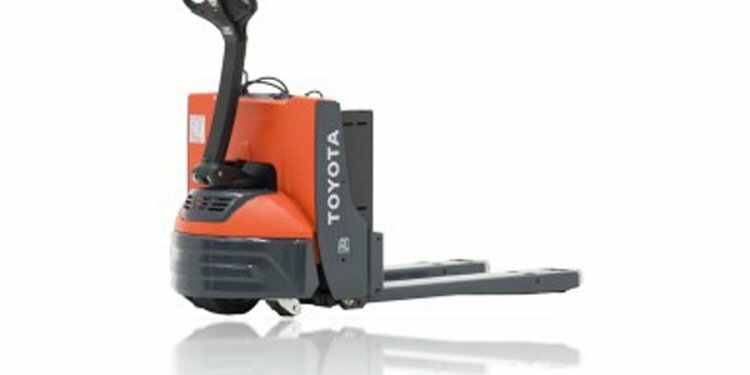 This walkie pallet truck has powerful acceleration with a top speed of 3.7 mph with a fully rated load. The unit can mae swift directional changes without hesitation, is low maintenance, and offers a 2 year warranty on the drive motor. The EJE walkie pallet trucks can be up fitted with an optional “ProTracLink” caster wheel system, linked via a cushioned torsion bar, which allocates stabilizing forces dependent on travel conditions (i.e. evenly across all wheels during straight travel; concentrated on the outer support wheel when turning). 3-phase AC technology ensures significant long-term reduction of lift truck operating costs. All forklift components are easily accessible through the one-piece front cover, and sealed controls and plugs are protected from dust and moisture. The optional "ProTracLink" stability systems helps reduce potential wheel damage during ramp operations due to its self-leveling adjustment.